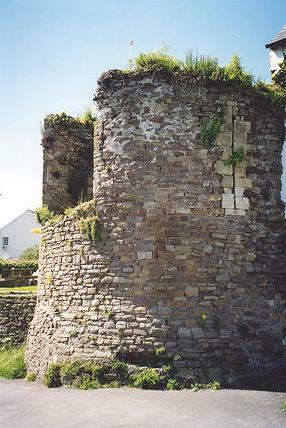 Above: remains of the Roman Watchtower attached to the Hanbury Arms pub in Caerleon near the castle. Caerleon saw centuries of Christian and Roman settlement and fortification before Norman invaders used this site for the steep motte of their castle in 1085. The motte had a tower, a two-towered barbican at the bottom, and the strong bailey eventually had at least a further two towers. The one tower that survives was probably erected in the middle of the 13th century. The castle was attacked and captured by the Welsh in 1217, and resisted another attack by the Welsh in 1231. The ancient and varied history of Caerleon has given rise to many legends, and it is often mentioned as being (as are other sites) the place where Arthur's palace stood, and from whose battlements it was possible (despite the intervening hills) to see the Bristol Channel. The castle enclosure is now entirely surrounded by walls and the site is well wooded.